It's an important first step to eventually blast Starship into Earth's orbit — and beyond. 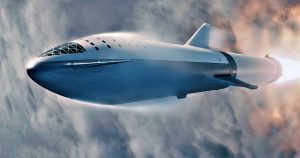 In a series of tweets yesterday, SpaceX CEO Elon Musk confirmed that the space company is about to start testing an early prototype of its Starship spacecraft. The so-called “hopper” test vehicle will feature only a single Raptor engine, as opposed to three for the final version. The test vehicle won’t enter orbit, but its low altitude test flights help prepare for future journeys as lengthy as a trip to Mars. Starship Hopper in preparations to hop, "Ooh ah, just a little bit". Local residents near SpaceX’s test site in Brownsville, Texas, received a notice in the mail informing them of test flights that could occur “as soon as the week of March 18, 2019,” according to local news. Checkpoints will be set up for a “safety zone” around the launch site. SpaceX successfully tested the Raptor engine in February. With three of them powering the spacecraft, Starship could eventually make its way all the way to the Moon or even Mars — or at least that’s the hope. Musk also tweeted that SpaceX didn’t bother building “a new nosecone for Hopper” after the original was damaged due to high winds at the Texas test site in January.